LG Mobile Philippines powers up San Beda Red Lions as the defending collegiate basketball champions make a fresh bid to take off and go for the NCAA Season 90 championship crown once more. 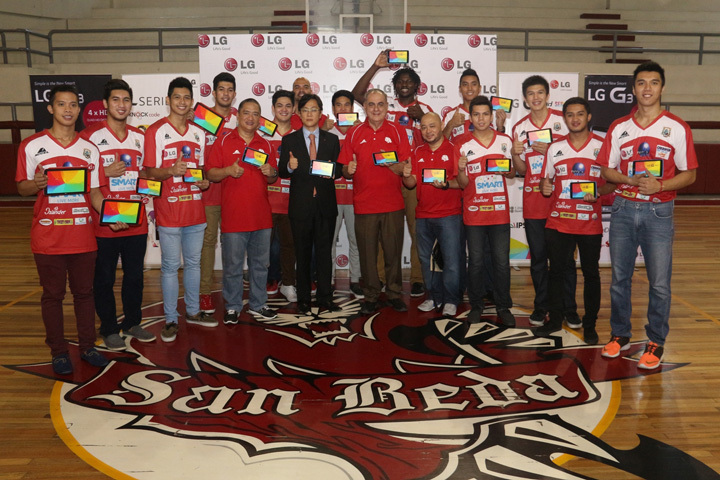 In the photo holding the newest LG G Pads are (center) San Beda Red Lions coach Boyet Fernandez, vice president for LG Mobile Philippines Jay Won, San Beda athletics moderator Edmundo Badolato, and team manager Jude Roque with the entire San Beda Red Lions basketball team. For more information about the new LG G Pad Series, visit www.lg.com/ph, www.lgblog.com.ph, orwww.LGnewsroom.com; like LG Mobile’s official Facebook page “LG Mobile Philippines”; or follow @LGPhilippines on Twitter and Instagram.